The saga of Cristiano Ronaldo's illustrious career continues with the release of Nike's fourth boot in the series. Chapter 4 continues where the previous chapter left off with Ronaldo's transfer to legendary club, Manchester United, as a talented 18-year-old eager to begin his journey to becoming one of the world's greatest players. Upon arrival, Sir Alex Ferguson bestowed the number 7 on his newest recruit, a jersey worn by Manchester United legends like David Beckham, George Best and Eric Cantona. Over the next five years, Ronaldo rose to the occasion and then some, leaving the club after being crowned the world's best player in 2008 and winning three consecutive Premier League Titles and a Champions League title. His success under the tutelage of Sir Alex Ferguson confirmed his destiny amongst the legends of football. 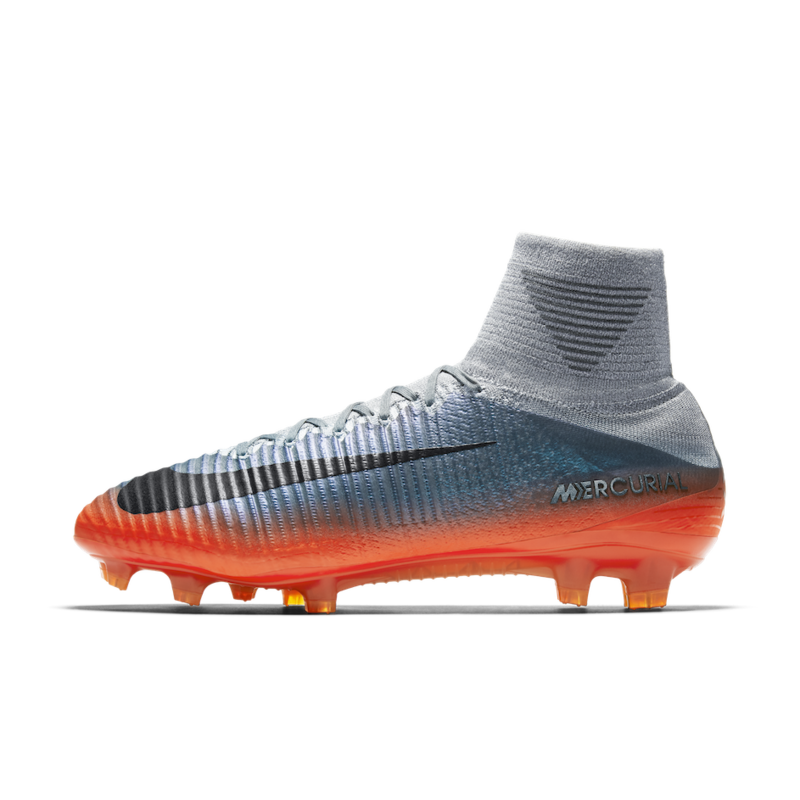 The "Forged For Greatness" Mercurial CR7 Superfly takes design cues from the smoldering hot irons used when forging metal. A vibrant orange and red soleplate transforms into a metallic upper that changes color from blue to silver. The CR7 logo features a prominent 7 to signify this chapter as the start of Ronaldo's name becoming synonymous with the lucky number. The CR7 "Forged For Greatness" Collection will be available April 10th in adult and youth sizes. In the chilly winter months, Nike is bringing the heat to warm players up for the spring season with the new Radiation Flare Pack. Black Nike Swoosh accents contrast with super bright upper colors like Volt, Electric Green, and Hyper Orange. This pack also features the brand new Hypervenom Phantom 3. The Nike Radiation Flare Pack is available in the shop and online here. 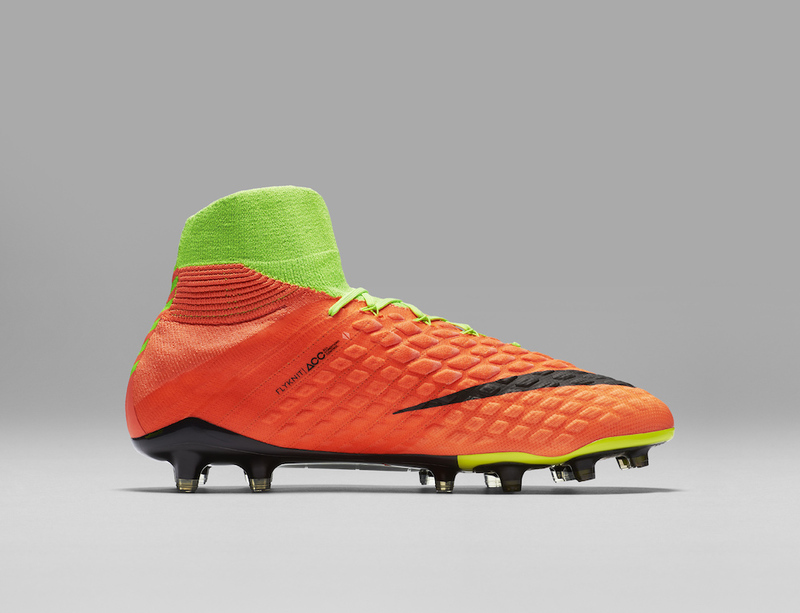 The most critical components of every striker's arsenal are the focus of Nike's third generation Hypervenom Phantom. The entire boot has been engineered for cutting and striking– allowing every striker to reach their maximum goal-scoring potential. Major improvements have been made to the upper construction, texture and soleplate. 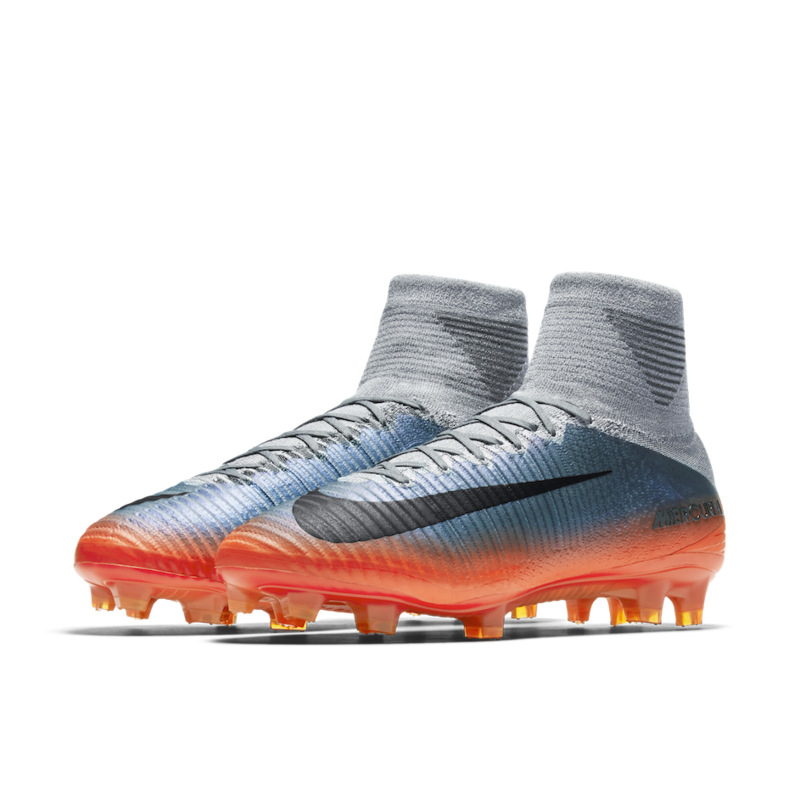 The most noticeable design changes to the upper are the use of Flyknit throughout the entire boot, and the new texture that utilizes foam pods instead of the dimpled design featured predominately in previous iterations of the Hypervenom. While the appearance of the new "pod" formation is a nod to the old texture, the composition of the third generation texture is entirely new to boot innovation. The pods react differently to the rate at which a ball is received or struck. When receiving a pass, the pods will soften and create a dampening effect on the ball. When striking at high speeds, the pods will become rigid to truly launch the ball. Two additional redesigns of the Flywire cables and the Dynamic Fit Collar also elevate the Phantom II to the next level. Three meters of Flywire cables (compared to 1m used in the second generation) now wrap around the middle of the boot and through each individual eyelet, allowing for a player to customize the amount of tension around their foot. The Dynamic Fit Collar is now cut at a diagonal to compensate for the extreme angle that ankles take during cutting. 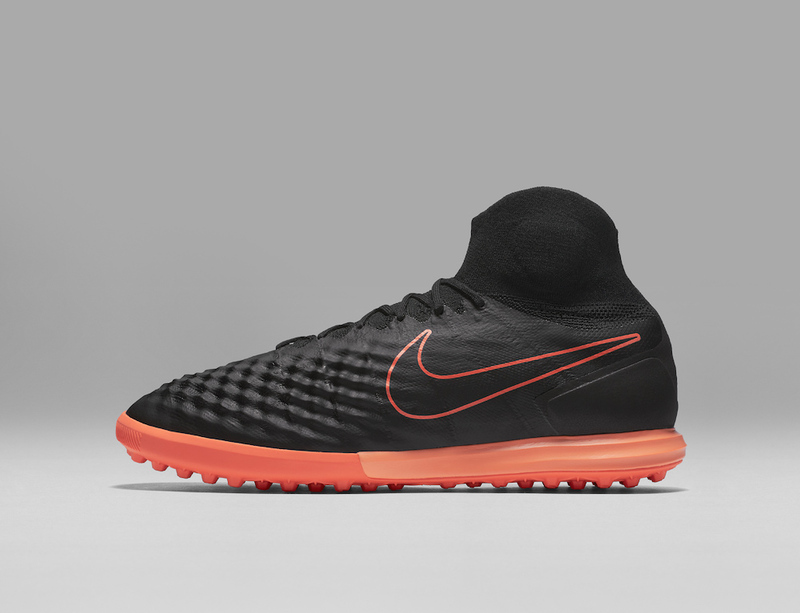 Two entirely new features include the low-cut version of the boot, and the new Hyper-Reactive soleplate. For the first time in a low-cut boot, the upper of the Phantom III is all Flyknit. It seems that Nike paid attention to the trend of players cutting off the Dynamic Fit Collar because they wanted the premium upper without ankle distraction. The new soleplate configuration provides both support and flexibility, and the traction pattern was developed for lateral cuts. Find the new Nike Hypervenom Phantom III in stores and online here. To ring in the arrival of the winter season, Nike has released an all new pack of colorways. The Dark Lightning Pack is predominately black, but with bright pops of color and a white Swoosh featured on the firm ground cleats. The indoor turfs and flats feature bright soles with an outlined Swoosh. The Nike Magista Obra and Mercurial Superfly will be available in the shop, as well as the MercurialX and MagistaX Turf Proximos, all in adult sizing. Low-top versions of this pack will be available in youth and adult sizes in flats and turfs.